You cross a narrow causeway to reach this island-like old town. Climb up the steps and take a circular walk, looking down to the sandy beaches backed by distinctive umbrella pines. For respite from the heat, descend to the Frantoio Ipogeo at Via Antonietta de Pace, one of many olive oil presses buried in the rock below the streets. 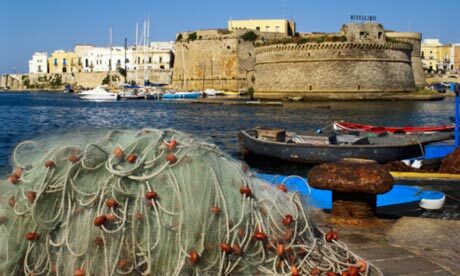 Oil from Puglia was shipped all over Europe from Gallipoli as lamp fuel, long before it became a culinary must-have! Discover where singer/songwriter Domenico Modugno got his inspiration for Volare in this small seaside town just south of Bari. We love to wander round the little streets of the medieval centre, which perches precariously on the edge of the limestone cliffs. For a truly special experience, eat at the Grotta Palazzese – this “summer cave” with its views over the Adriatic was carved out of the rocks by a local lord to create a party venue in the 1700s. This crumbling medieval town sits beside one of the gravine, or ravines, that score the landscape on the border between Puglia and Basilicata. Hewn from the rock on which they stand, many of the buildings are worth seeking out; look for the church of San Michele delle Grotte and the Osteria Grano e Vino. The big attraction for outdoorsy types is the nearby Alta Murgia national park, a protected plateau. The central square, Piazza Sant’Oronzo, is on a Roman amphitheatre, part of which is still uncovered. Within walking distance from here is the Chiesa di Santa Croce, one of the most beautiful examples of southern baroque buildings. A few yards away is Piazza Duomo: the cathedral, Bishop’s Palace and bell tower create a spectacular sight. On the road between Casalabate and San Cataldo on the east coast, turn off just beyond Torre Rinalda on one of the many unpaved tracks that peter out where the dunes begin. Clamber over the dunes, pick your spot – it’s rarely busy. The sea is warm and turquoise and there is this secret to be discovered: 50m offshore, just below the surface, lies a wrecked ship, sunk by the British navy in 1941. It’s not deep – just take a big breath, dive down, cling on to the beams of the hull and move from one to the next for as long you can hold your breath. Magic. We stayed at this wonderful beachside site on the Ionian side of the Salento peninsula. There were no other English campers when we stayed there – a grasp of Italian comes in useful. You’ll pretty much have the large oval pool to yourself as the Italians spend all their time sunning themselves on the beach or cooking long lunches under the trees. The setting’s spectacular – not for nothing are the beaches here dubbed “Les Maldives”! The seafront is compact, fronted by old townhouses which double as waterfront cafes. Here you can pick up an Africano (espresso with Disaronno, fizzy water and ice). I’d recommend spending the afternoon on the lovely beach and, as the sun begins to set, heading south a few miles towards Lido Conchiglie and one of the fish restaurants, on the water’s edge. This agriturismo is a stunning find, well-priced in comparison with others in the area. Rooms, mostly apartment-style, are in the well-kept grounds and balconies have a view out to the ice-white buildings of Peschici, framed by the blue sky and olive trees. Half-board is a gastronomic experience, with almost all of the food being locally sourced. Dinner offers a table groaning with fish, meat, pasta and vegetables. 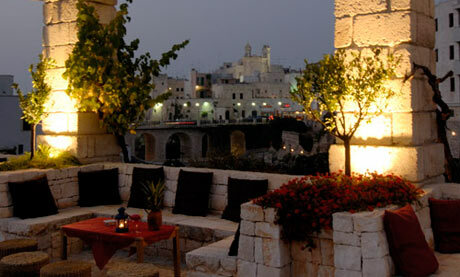 This beautiful restaurant/bar overlooking Polignano’s old town is OTT Italian chic and a bit pricey, but come here in the evening to see one of the most spectacular sunsets in the region. After dinner walk down the authentically dilapidated Roman road to a pebble cove to enjoy the view of the caves and the old town built into them, the sounds of the sea, the giggles of young locals, and the odd poorly but enthusiastically played guitar. This is a fantastic local basic restaurant in a characterful square serving typical local food with lots of veg (this region is great for vegetarians). The old dad of the two young owners makes the wine and the liqueurs (including prickly pear and wild fennel), sings songs and flirts like mad with the girls of all ages. He is 75 or so, so watch it – he has a lot of experience. The horse stew is great. Come see the locals dancing the tango in the town square of this beautiful hill top village and if you are feeling hungry visit La Taverna del Duca on Via Papatotero for excellent rustic Puglian food and wine. Bellissimo! Palazzo Siena is a truly hidden gem, which I can’t recommend enough. 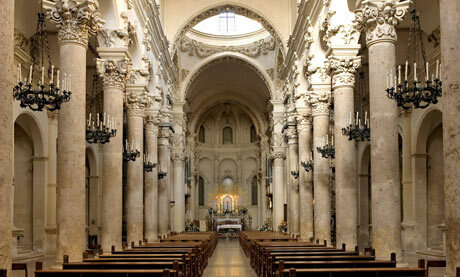 On a hot summer day we drove through the sleepy town of Minervino di Lecce. We pulled up outside a hotel that looked practically desolate. But when the doors opened, Palazzo Siena was revealed in all its glory. New this summer, it’s a family-run boutique B&B and a food and design haven. The owner has decorated the hotel in an Italian old-fashioned style with modern accessories. The patio has a beautiful sea water pool. Food includes typical Puglian treats such as Friselle bread with olive oil, oregano and tomatoes. The eight rooms are spacious and comfortable and there’s not a sound from the street. The hotel is close to the crystal clear waters of Salento if all the quietness gets too much. The best place to base yourself in Puglia is a trullo and Trulli Stella is a little off the beaten track, surrounded by farmland and olive groves. It has its own fully equipped outside kitchen and pizza oven and if you like, Maria, the manager, will visit with her mother, and cook you an amazing meal with enough leftovers to last an week, using ingredients from the garden and the local market. You’re handy for the hilltop towns of Locorotondo and Cisternino. In the former you can pop in for a sweet cake and deliciously strong espresso, before heading into the market to buy more ingredients for cooking those long leisurely lunches in your trullo. In Cisternino head to Pizzeria Da Angelo for some delicious wood-fired pizza, sitting among teenagers, young families and grandparents. Villanova di Ostuni has some of the best local beaches: crystal clear waters, acres of white sand and a sweet marina. This local trattoria does the most amazing seafood. The grilled octopus is to die for. The atmosphere is jovial and no nonsense, offering great value food that really stands out even in a town full of great seafood places. It was so good that when we came back to Bari a year after visiting this place for the first time, we spent an hour trying to find it and squeeze in a last minute lunch before catching the plane back. This fantastic restaurant appears to be a private house and seems to be run by a bunch of friendly, bustling, chatting women – it’s like being invited into an Italian family. The restaurant serves cucina poveraspecialities which are all superb. Dish after dish appears: blanched chicory in white bean purée (we were shown by a kindly waitress how to blend it with olive oil and crumbly fried bread); home-made oreccheitte with greens; potatoes baked with mussels and cheese. A neighbouring diner with some English insisted we have a glass of a local tipple with our expresso. It was on the house. One of the best lunches we’ve ever had. This a lovely restaurant set near the gorgeous village of Peschici (at Punta San Nicola) has a beautiful view of the bay, and sunset if you go there for dinner. 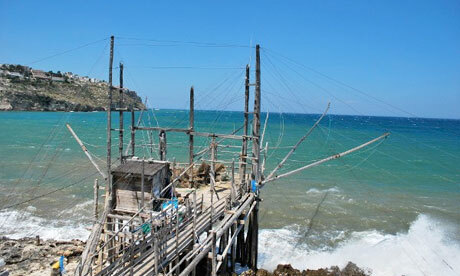 The trabucco is an old fishing structure typical of the Gargano. This restaurant offers fresh fish and is a great place to end a hard day at the beach. Finish off with a gelato in Peschici town. Ostuni is a city of white buildings on a hill that looks stunning as you drive up the winding roads to get to it. Itdoes not seem to cater to foreign tourists so there are plenty of opportunities to practise Italian. In restaurants children will get smiles from servers and special suggestions about what to eat on the menu of wonderful tasting food at very reasonable prices. Ostuni is a solid base from which to experience Italywith the family and for fewer euros than more popular Italian destinations. 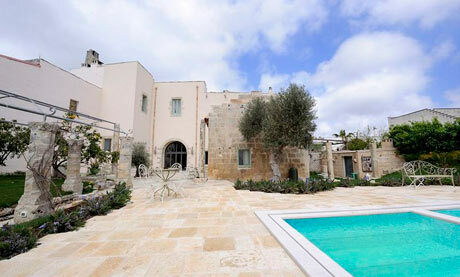 The Masseria Fumarola is a farmhouse converted into a beautiful boutique hotel. Every room is unique, the outside space is fantastic, from a drink on the terrace, alfresco eating, to the beautiful pool and the surrounding fields. But most importantly, the food there is divine, from the breakfasts, which I still dream (try the carrot cake) to the best ever antipasti buffet I’ve ever seen. This is a stunning and enchanting natural park in the Salento area, a protected area of very wild and luxuriant pinewood that leads, after a 20 minute walk, to an amazing little creek surrounded by white rocks. The water is crystal clear and the surroundings do not get too busy so it is the perfect place to relax having a bit of privacy. There are several trekking paths, some quite challenging, that lead to other areas such as the Uluzzo tower and the Grotta del Cavallo. A hotel in a cave! The Sassi in Matera is a Unesco world heritage site, a stunning collection of cliffside cave dwellings with ornate carved stone frontages. Best viewed from the ravine opposite the town, the scene is positively biblical. Mel Gibson used the Sassi as Jerusalem’s double in The Passion of the Christ, but don’t let that put you off. The area was run down and basically a slum until the 1970s, but in the past 10 years the unique charms of the Sassi are finally receiving their dues. 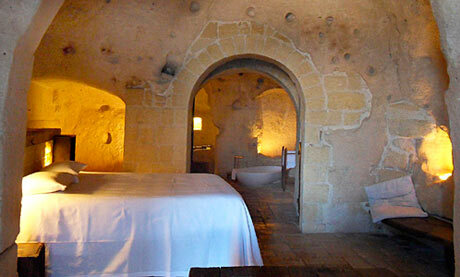 Le Grotte della Civita is a boutique hotel where Philippe Starck bathtubs stand proudly in bare limestone caves, the sparseness of the setting uniquely romantic, artistic and beautiful. 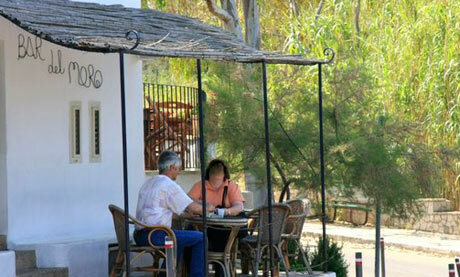 The breakfasts are delicious as well, and it’s a brilliant spot from which to explore the region. I thoroughly recommend picking one of the small, whitewashed hilltop towns in the beautiful Valle d’Itria area as a base. I happened to pick Ceglie Messapica, which is known for its excellent regional cuisine. It is less expensive than the better-known towns, such as Ostuni or Alberobello but close enough to explore a range of places like Martina Franca, Cisternino, Locorotondo, Ostuni and Alberobello, as well as the lovely and sandy Torre Canne beach. A car is essential and driving through ancient olive groves with dark red earth dotted with trulli is an absolute pleasure – but make sure you have a satnav! The butchers in this village are open well into the evening and they give you the option to choose the meat you like from their fridge. They will then cook it for you fresh and then serve it with chips, salad and regional wine. This is typical for the region but no tourists would know about it – I was shown this by a Pugliese friend. There is something magical about beaches surrounded by pine forests, and Punta della Suina is one of these gems. The sea is classic Salento – calm and so transparent it’s unreal. It has stunning views of historic Gallipoli, and not many Italians know of its existence. Avoid the lido (expensive and a tad loud) and walk until you find your very own spot – lie down and let the smell of the pines trees fill your lungs. This fantastic restaurant was recommended by an Italian friend from Lecce and it is wonderful. The outdoor terraces overlooking the Ionian Sea have a relaxed atmosphere and are busy with local and holidaying Italians. There is no written menu; the dishes comprise what is available daily – an array of delicious antipasti served tapas style, followed by a seafood pasta course, and if you have room, a fish course too. Portions are huge and tasty. My name is Sonia and I am a real estate agent working in Puglia where I was born in 1976 and where I live. Every day I deal with different requests, from people looking for their dream home or holiday accomodation to who is longing to sell or to let. My clients say that I am very responsible, precise and reliable but I must add that application and full dedication are the success of my goals. Whether you are looking to buy/rent or for information, please, do not hesitate to contact me and I will be glad to assist you.